You would have come across natural Himalayan salt lamps in your search for natural remedies for anxiety. Regardless of the health claims made by both supporters and defectors alike, they are definitely trending at the moment. Driven by curiosity, I’ve made my own research on this and here is what you need to know about Himalayan salt lamps. Like the name implies, Himalayan salt lamps are made of natural salt that has existed since the ancient time in the earth. They are mined from the deep undergrounds of Pakistan. An opening is then crafted to a piece of the salt rock for a light bulb to be inserted. When turned on, the light bulb produces heat and a pinkish orange glow that creates a soothing environment in a room. 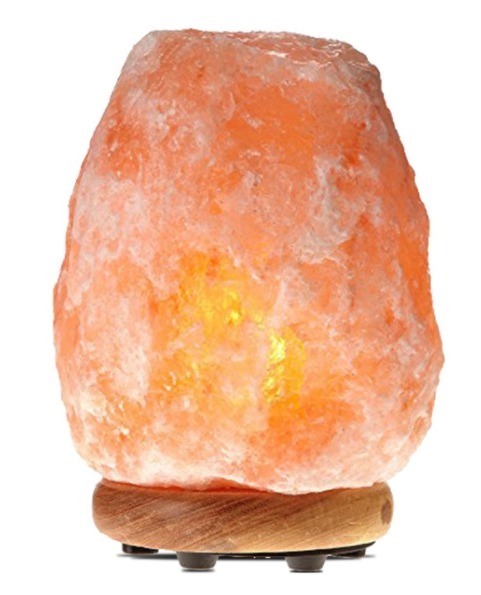 This is essential to the various benefits claimed of Himalayan salt lamps. The science that turns the lamps into popular essential items for wellbeing lies in the hygroscopic quality of the salt. Salt is known to naturally attract water. The same theory applies to the big piece of Himalayan salt rock sitting in your room. Water particles in the air may be contaminated with bacterias or pollutants. A Himalayan salt lamp would pull the water particles toward it along with the pollutants. As the pollutants got stuck to the lamp, the water is naturally released back into the air through the heat generated by the lamp. The result is a much healthier and fresher air in your room. It is only natural if you find your Himalayan salt lamp became dusty after a couple of weeks. Does Himalayan Salt Lamps Actually Help Anxiety? The entire debate on the effectiveness of Himalayan salt lamps centered around the release of generation ion. Negative ions are natural molecules that cause the increase of serotonin and provides a calming effect on our mind. While not conclusive, some studies have linked the presence of negative ion to inducing a more positive state of mind. Claims that Himalayan salt lamps help anxiety is based on the fact that the salt rock releases negative ions into the air. While some articles promote the virtue of Himalayan salt lamp on this basis, others refute the claim, citing the amount of negative ion is too little to significantly affect our brain. I’ve tried to locate any research and studies that would either conclude or refute this but to no avail. It seems that articles that are dismissing the benefits of Himalayan salt lamps are actively promoting ionizers to their readers. (and vice versa). To be fair, I’ve turned to Amazon and search for some of the best natural Himalayan salt lamps that are available. I hoped the reviews by the customers would shed some light on the effects of anxiety but I was sorely disappointed. There is not much information that I could gather in that respect. However, people who have used the lamps claimed that it actually purifies the air in their room. Some even claimed that it creates a relaxing atmosphere in their room for better sleep. As of now, there are no conclusive studies that point one way or another on the effects of Himalayan salt lamps for anxiety. But they are not totally worthless after all. While the opinions of how effective Himalayan salt lamps are for anxiety, they are worthy to be placed in your room. Here’s why. It is a known fact that electronics gadgets emit electromagnetic waves that are harmful to our health. They are linked to your increased stress level and low mental energy. If you’re constantly exposed to smartphones, laptops, TV or tablets, you’ll be drained of positive energy before you knew it. The number of negative ions released by the Himalayan salt lamps could be of any amount. Even if it’s proven to be of a lesser amount, the negative ions will still help to reduce the effects of harmful electromagnetic radiation on your health. Salts are hygroscopic and no marketing agenda can twist this simple fact. Placing a Himalayan salt lamp in your room does indeed attracts water particles and purify the air of your room. While there’s no guarantee that it can keep your room free from bacteria, it reduces contaminants to a certain extent. It’s safe to say that breathing in fresh air helps to energize your mind too. You’ll know what it’s like when you took a break from the polluted city to a secluded and clean beach. The refreshing sound of waves crashing on the sand and the scent of the unpolluted sea will definitely lift your spirit. It doesn’t matter if it’s the negative ion or the soft glow of pink-orange light from the salt lamp, but it does create a relaxing environment in your room. Along with a fresher air, you’ll definitely get to sleep better with a natural Himalayan salt lamp beside your bed. Due to the hygroscopic nature of the salt lamp, the surrounding air has lesser pollutants that could trigger asthma in certain people. Again, there are no studies conducted to verify this but conversations from people using the Himalayan salt lamp for better air quality shows promising results. 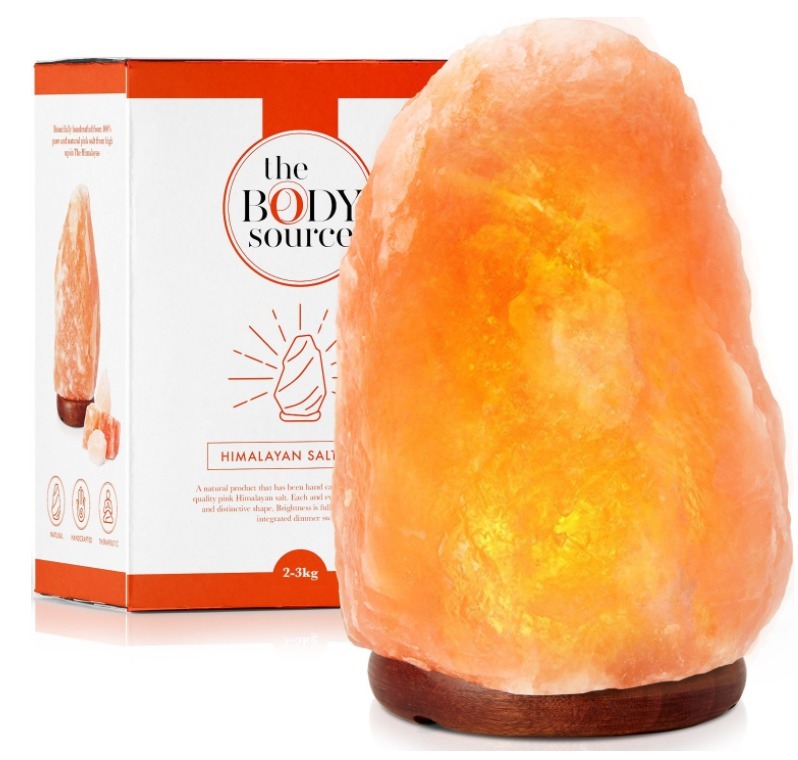 There are probably more claimed benefits of Himalayan salt lamps but they mostly originate from the release of negative ions and hygroscopic nature of the salt rock. Choosing the right Himalayan salt lamp can be a tricky process. First of all, you have to avoid the fakes. Here’s how to identify a fake Himalayan salt lamp. Himalayan salts are extracted from a mine in the Punjab district of Pakistan. If the manufacturer stated otherwise, be prepared for a fake lamp. Salts are not known to be sturdy. If your salt lamp is harder than steel, you’re not getting a genuine Himalayan salt lamp. The salt rocks may sweat if you turn the lamp off as they naturally attract moisture. If your lamp is as dry as a desert, then you should ask for a refund. Your lamp shines too brightly instead of the soft pink or orange. The texture of a real salt rock reduces the brightness of the lamp drastically and in an uneven manner. You bought a white or grey Himalayan salt lamp and it’s the same or cheaper price than the orange lamps. The former is rare salt rocks that should be much more expensive than the common ones. 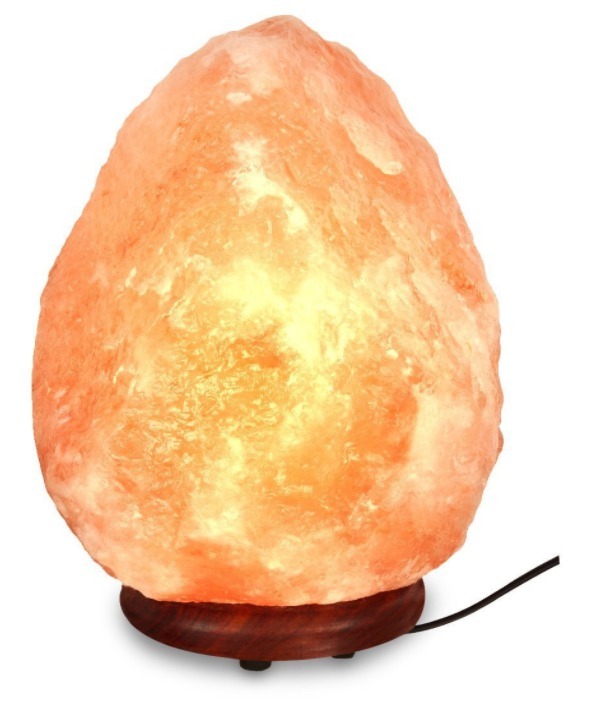 If you suspect that you’re being conned with a fake Himalayan salt lamp, simply run the salt rock in hot water. If it’s genuine, the salt would gradually melt under the hot water. If it remains intact, you’ll know that it’s made of anything but genuine Himalayan salt rocks. Now that you’re able to sort out the fakes, here are the considerations for selecting our ideal Himalayan salt lamp. Quality – There’s nothing you can do about the quality of salt rocks as each is unique. But do check for the quality of the installations and lamp sockets. Size – Salt lamps can range from 5 lbs to 50 lbs. Depending on the size of your room, you’ll need to select the right fitting salt lamp. Color – Orange salt lamps are the common one. If you need something rare, look for white salt lamps. If you need a darker variant of the salt lamp, go for the red ones. Shape – Some salt lamps have been crafted while most remain unaltered in their natural shape. The latter is preferred by most. You can probably get Himalayan salt lamps in your local lighting shops. But I’ll suggest buying the lamps online to save your time and traveling cost. I always recommend Amazon when it comes to shopping for items that are wellness related. You’ll find that some of the best brands of Himalayan salt lamps are available there. Besides, you’ll get to read reviews from hundreds of customers who have already bought them. In case you think you bought the wrong product, getting a return arranged is so hassle-free. Himalayan salt lamps are extremely popular and there are many brands claiming to offer the best products. 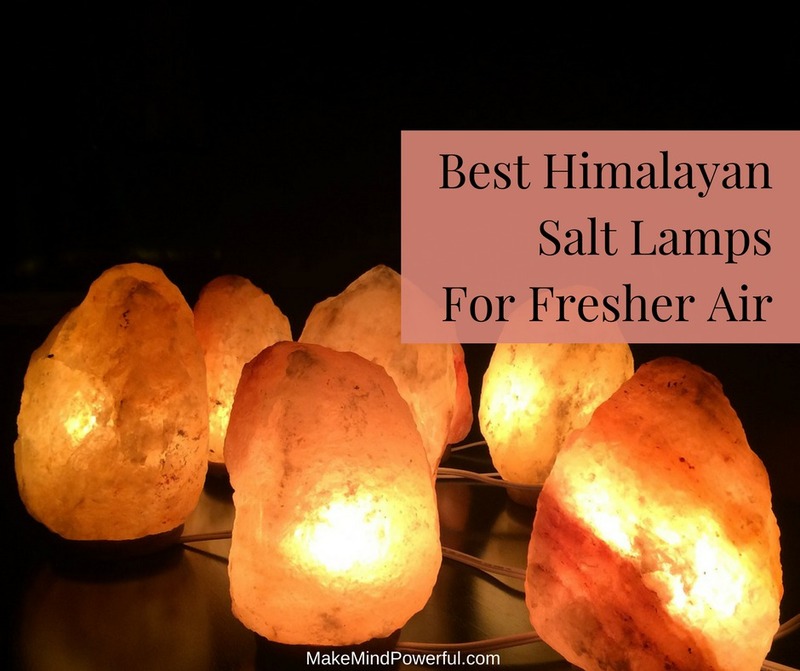 To spare you the painstaking process of browsing every single product, I’ve created this list of the best Himalayan salt lamps for you. Levoit is one of the leading brands of Himalayan salt lamps, with a broad product range, this is one of the popular model loved by their customers. Made from natural salt rocks from the mine of Pakistan, the lamp helps you to stay refreshed as it reduces dusts and pollutants in your room. If you’re constantly feeling tired after working with your PC for a while, placing this salt lamp may help, as it reduces the effect of electromagnetic radiation. You don’t have to worry about the salt rock toppling over it was supported by a sturdy rubberwood base. You also won’t have termite or corrosive elements damaging the wood base either. With three options of different sizes to choose from, you can place the lamp anywhere in your room. It’s great for creating a cozy environment in your study room or use the soft pinkish glow to induce mood for bedtime. The lamp is shipped with a gift box, which made it an ideal choice of a present for various occasions. Safety is a great concern when it comes to lamps and Levoit has definitely taken care of that. A 6.6 ft. power cord with a touch dimmer switch minimizes the risk of fire hazard. It comes with a total of 15W light bulb that will last you for a while before you need to buy replacement bulbs. Creates calm sensation of yoga and meditation. Ships with 2 replacement bulbs. The dimmer switch is damaged in very rare cases. The beauty of genuine Himalayan salt lamps lies in the uneven natural texture of rich minerals. 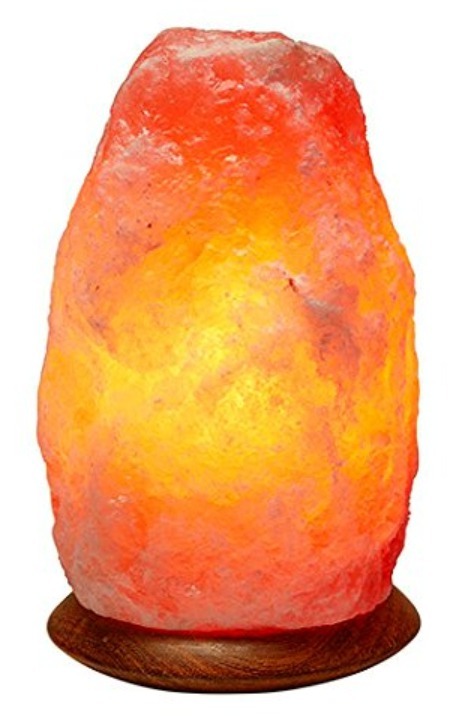 This lamp from Himalayan Glow has all the characteristics of a top quality salt lamp. It’s irregular and rough surface creates a warm amber glow in your room when turned on. The source of the salt rocks is from Pakistan itself. You’ll find that not only the salt rock is the best quality, but the skills of master crafters shaped the lamp to a unique form. It is believed that when you lit up the lamp, you’re radiating the through ancient salts left by the ocean when it once covered the earth. Besides the salt rock, the wooden base is also made from a type of tree in Pakistan. It is known for its termite resistant and anti-corrosion qualities. It’s the perfect base for your salt rock to rest upon. This Himalayan salt lamp is so crafty and elegant that it will be a great decor gift for your friends. You’ll benefit from the reduced pollutants in your air when you turned on the salt lamp in your room. The ETL approved dimmer switch is also handy for you to adjust the brightness to create the right ambiance. As you sleep through the night under the soothing glow, you’ll feel much refreshed in the morning. Naturally mined Himalayan salt rock. Anti-corrosive and termite resistant wooden base. Helps you feel refresh as you sleep. Faulty dimmer in some cases. This Himalayan salt lamp by Inviting Homes is an epitome of ancient elements meeting modern technologies. If you’re obsessed with smart home and having control of every electrical item with a touch on your smartphone, this salt lamp is meant for you. You’ll get to enjoy the purifying effect of natural Himalayan salts through the special apps provided by the manufacturer. Just ensure that you have reliable WIFI coverage in your room or anywhere in your home you wanted to place it. What’s even better is that you can control up to 50 of the lamps with a single app. But if you’re not in the habit of carrying your mobile phone around in your home, the simple dimmable touchpad will be at your service. A quick touch and you’ll be able to turn on the lamp. The sturdy wood base made it easy to place in various parts of your home. You can use it to freshen the air of your workplace, living room or kitchen if you feel that they deserve a fresher air. It’s a beautiful salt lamp the turns your living space into a relaxing spot with its warm pink-orange glow. Naturally mined Himalayan salt rocks. 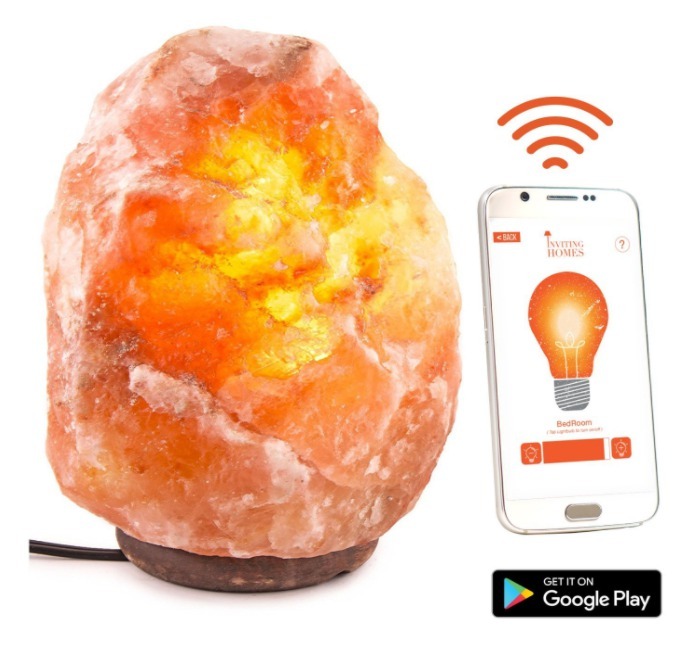 Link up to 50 salt lamps with a single app. Touch dimmable switch for offline control. Sturdy wooden base made of the Neem tree. Defective salt lamps in some purchases. 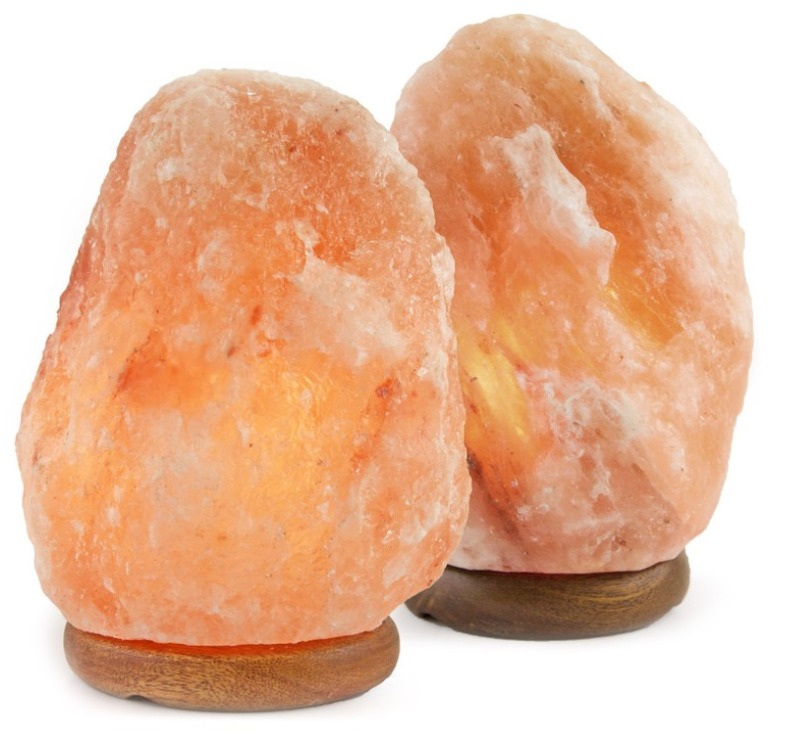 Ranging from 5lbs to 8lbs, this pair of Himalayan salt lamps is definitely an economical buy as decor for your home. Craftily mounted on Neem wood base, they will fit in well with the interior of your home. As you turn on the lamps, they will start attracting and purify the moisture in the air. 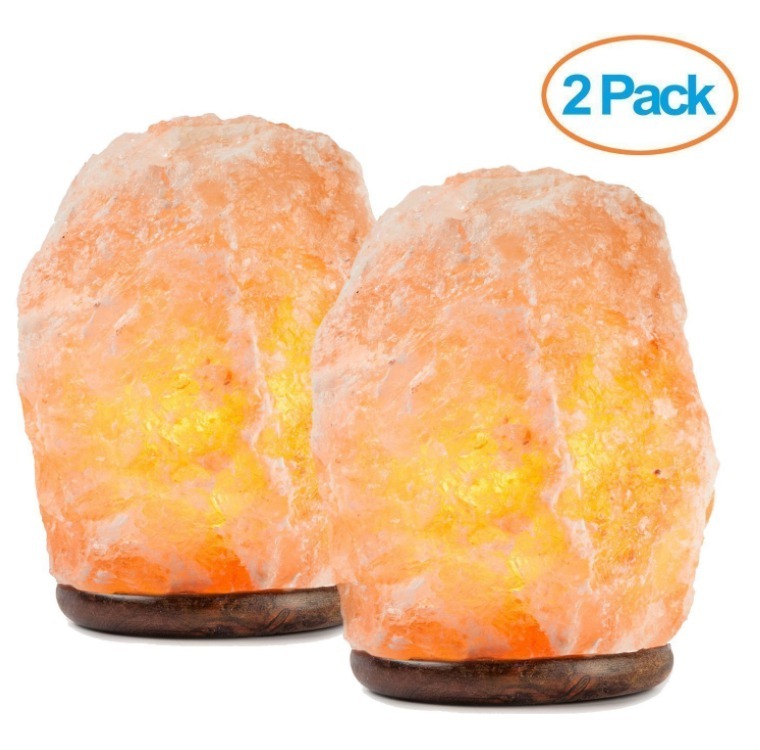 The 2 piece set of salt lamps shipped with low wattage halogen bulbs, that generate just enough heat to vaporize moisture that’s attracted to them. Without the heat, the salt lamps will be ‘sweating’, indicating they are pure Himalayan salts as indicated by the certified pamphlets. You’ll never get an identical pair of Himalayan salt lamps. Each is uniquely mined and crafted from the earth. They will have individual textures that allow an uneven glow of light shining through. The warm orange glow is great for creating a relaxing atmosphere in your room. They also made great bedlight as you can dim the light to create a romantic atmosphere in your bedroom. Not only do you fall asleep easily under such environment, you’ll wake up the next morning feeling energized and well-rested. Economically priced for 2 salt lamps. Great for creating a relaxing ambiance. Made of authentic Himalayan salts. Bulb holders are faulty in some purchases. It remains to be proven if the Himalayan salt lamp has an overbearing effect on producing negative ions to the air. But this salt lamp by Windsor Seasons definitely will create a soothing ambiance in your home as the calm hue of amber radiates from its core. The salt samp was made from high quality natural Himalayan salt rocks and shaped by master craftsmen. Only the best quality of salt rocks are selected to make these lamps. Under the experts, they are meticulously crafted to provide the best glow through dense ancient minerals. Any of these salt lamps weigh between 6 lbs to 8lbs and they sit perfectly on the Neem wooden base. Not only the wood grain on the base made an ideal decor, they do not shrink or corrode easily. It will also be free from termite infestation if that’s a problem that you’re concerned about. An updated power cord by the manufacturer allows you to easily control the lamp with a dimmable switch. 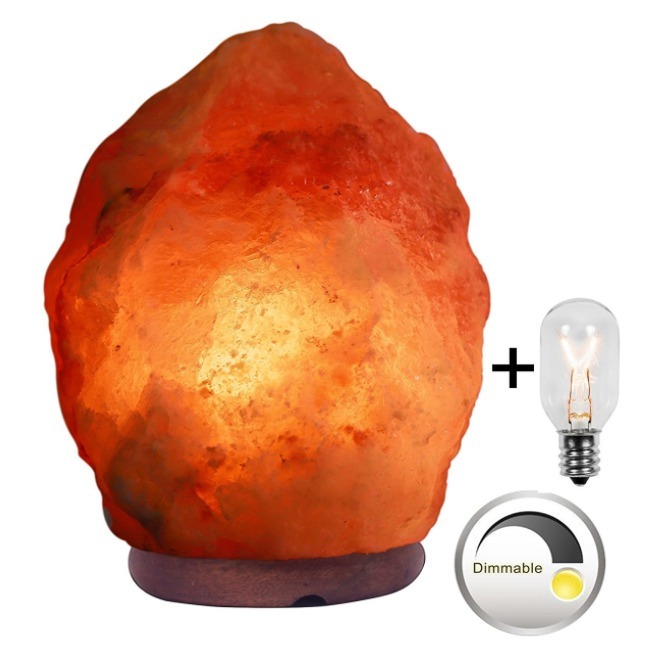 With the required safety approval like FCC and CE, you’ll have the peace of mind using the salt lamp in your home. Selected from the best Himalayan salt rocks. Mounted on sturdy Neem wood base. Bulbs are defective in some purchases. Carefully selected from the best Himalayan rock salts, the salt lamps from Voltas have lesser dark spots and allows more light to shine out of it. It will be a remarkable addition to your home as both decor and a natural air purifier. You’ll get more negative ions in the air to reduce the adverse effects of electromagnetic radiation from electrical gadgets. Besides that, it reduces the number of harmful allergens floating in the air. It’ll benefit anyone suffering from asthma. The high-quality wood base ensures that the salt rock would sit steadily on top of your side table without toppling over. Controlling the lamp is easy as there’s a dimmable control on the power cord itself. It also ships with an additional bulb, which means you do not need to wait for a new bulb in case the old one burnt out. Not only it is made of high-quality pure salt rocks, Voltas ensure that the lamp is properly packed with shrink wrap. This prevents any moisture to build on the salt while it is being delivered to your home. You’ll receive the salt lamp in the exact condition as it leaves the hand of the expert craftsmen. Comes with a replacement bulb. Packed with shrink wrap before delivered. High quality natural Himalayan salt rocks. Dimmable control for adjusting brightness. Creates cleaner air for people with asthma. Rare cases of defective lamps. If you have no luck in getting the right Himalayan salt lamp for your space-constrained room, this unit from The Body Source will be your ideal pick. Averaging 6 lbs and measuring between 6″- 8″, they will be perfect for your side table. The air purifying quality of natural Himalayan salts can turn a stuffy small room into a comforting area. With a fresher air, you will be more comfortable staying or sleeping in the room. Besides that, the higher amount of negative ions in smaller space and improve your mood as well. You’ll have perfect control of the ambiance by adjusting the dimmable switch. There’s also a replacement bulb in the beautiful box to ensure you get the comforting glow immediately. The stable wooden base is both practical and aesthetic when placed in your room. It’s hassle-free set up for this salt lamp. The manufacturer ensures that it’s fully assembled in the factory and all you need is to plug the power cord into the outlet and turn it on. There’s also a helpful instruction manual in the box if you need further guidance. Dimmable switch for brightness control. Sourced from natural Himalayan salt mine. Broken switches in rare cases. One of the best natural Himalayan salt lamps around, the lamp features a beautiful authentic Indian Rosewood base that made perfect decor for spas and studios. The lamp itself is made from 100% genuine Himalayan salt rocks and handcrafted by skilled experts. If having an additional electrical item in your room causes a safety concern, you’ll be glad to know that the lamps by Mineralamp are tested and comply with the ETL standards. You can adjust the lighting with the dimmable switch safely. Each of these salt lamps may slightly vary in size and texture, but boast the same benefits to your health. The nature of salts is inherent in the lamp as they attract moisture in your room and purify it into clean water vapor. The origin of the salts are not high on the mountains of Himalayas but deep in salt mines beneath. These priced possessions of the earth made perfect gifts for any occasions. It will be a pleasant surprise for your friends and family. The wooden base is made of high-quality Indian Rosewood. Naturally sourced Himalayan salt rocks. Designed with compliance with ET standards for safety. Creates a relaxing orange glow. Some of the bulbs burnt quickly. 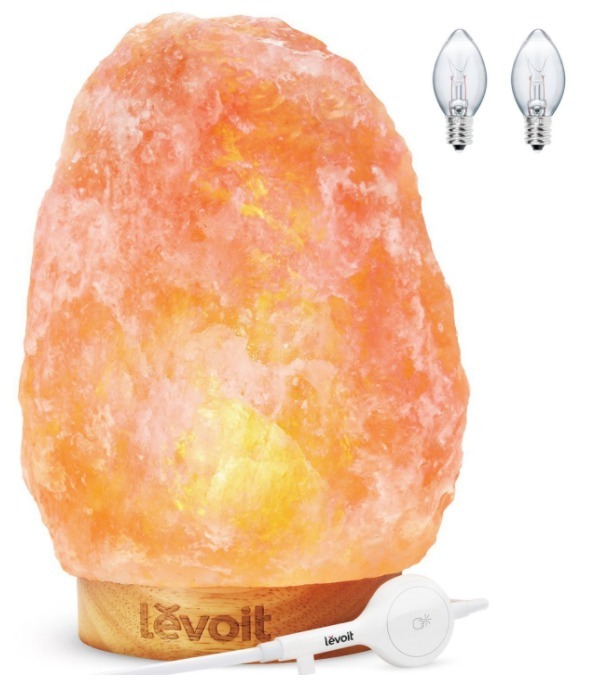 If the smallest size of desk-mounted Himalayan salt lamps is too bulky for you, these wall plug versions may be what you’re looking for. Obviously, they are much smaller than their desk-mounted counterparts, but they work perfectly to purify the air of your immediate surrounding when plugged into the nearest socket. You don’t have to deal with cords and you can spare your desk or side table for placing other items. 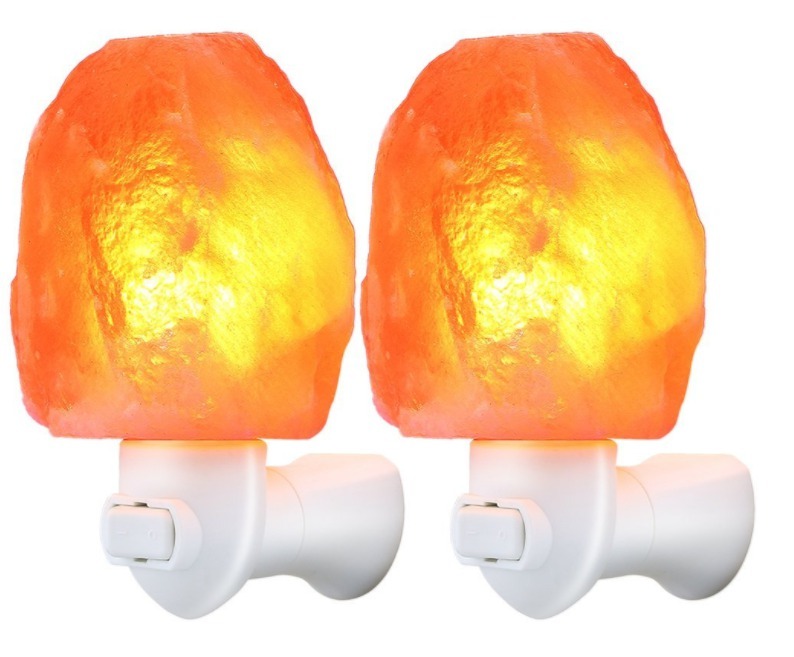 With these salt lamps plugged into your wall socket, you’ll enjoy the similar warm glow from the Himalayan salt rocks. The unique feature of this pair of lamps is that you can adjust the lamp 360 degrees. This makes the lamps fit easily into walled sockets that may have limited space around them. If you have a couple of sockets near your bed, they will create a romantically charged atmosphere in no time. While convenience is the key feature with these lamps, they are made from the finest Himalayan salt rocks that created by ancient sea beds. The lamps use 7W bulbs and there are additional 2 spare bulbs shipped in the box. No cords and save spaces. Pure natural Himalayan salt rocks. The smaller size of rocks may cause the light to be too bright for some. These salt lamps are handcrafted by masters from Pakistans, where the salts are mined. The Himalayan salt rocks are hollowed out with care and mounted to fitting wood bases. You’ll find that these Himalayan lamps will enhance the interior decor of your house. Beauty aside, the natural properties of the Himalayan salt ensures that your house is purified from harmful bacterias and allergens. These contaminants will be attracted together with the water particles to the rock. The result is a purified air that is refreshing to breathe. You’ll also find that the soft amber glow from the lamps creates a conducive environment for relaxation and sleep. They will be ideal for your bedroom and living rooms. The inoized air around the lamp also helps to reduce your stress. They are carefully wrapped in air-tight material to prevent water from forming on the salt. These are definitely perfect gift ideas for your friends and family on many occasions. The qualities of primordial salts would gently relax their mind and body. Elegant gifts for any occasion. Produces soft and relaxing amber glow. Some customers received an incomplete or broken package. When you’ve got yourself a Himalayan salt lamp of the best quality, the next step you need to learn is how to care and clean them. Unlike your normal lamps, they do exhibit special behaviors, such as “sweating” and they may actually melt gradually if you clean them the wrong way. Here are some helpful tips to help you out. Use a soft fabric to dry any moisture that accumulates on the lamp. This can happen when you are placing the lamp in a humid area. Turn on the lamp 24/7. The heat will keep the moisture away in most cases. Wipe off any dirt with a moistened cloth. Make sure you do this after turning off the lamp and let it cool down. Do not use wet clothe to clean it. Finally, use a dry fabric to dry it off. If you’re not going to use the lamp for a while, wrap it up so that it is not exposed to dust and moisture. In the case of a burnt out bulb, get a replacement with the same Wattage. 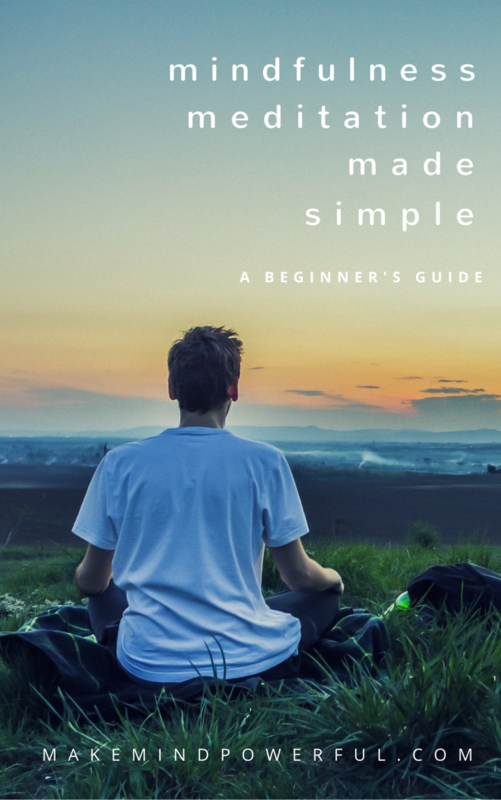 Regardless of whether you’re buying a salt lamp for anxiety, purifying air or simply because you love it as a decor, I hope this list of the best natural Himalayan salt lamps serves you well. If you’re already using a Himalayan salt lamp, share your experience with our readers in the comment below.